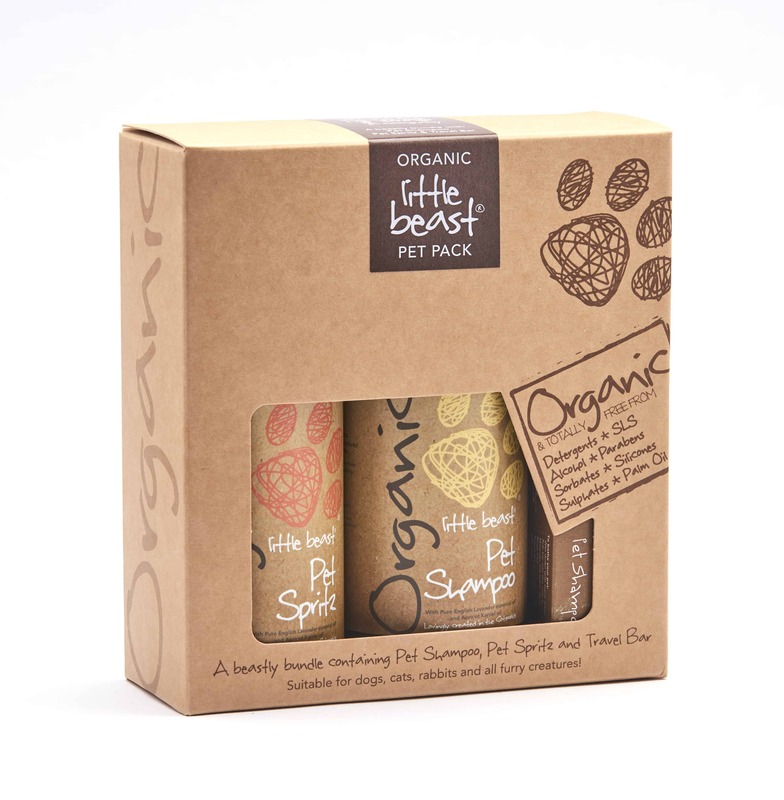 An Organic Trio of Pampering Pet Products! Pet Shampoo – 250ml Our shampoo can be used all over (avoiding the eyes) on all coat types, just to rinse muddy paws and dirty patches…or on anything more unmentionable! 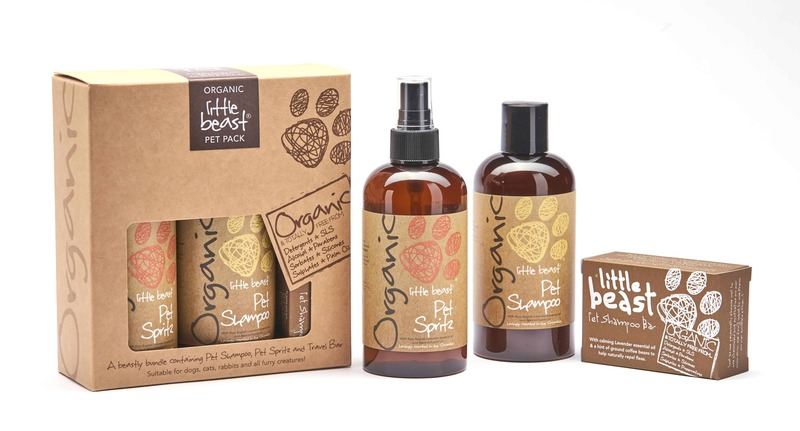 The Little Beast Organic Liquid Shampoo is concentrated, so you only need a small amount per use. Directions: Rinse your pet with warm water and rub the shampoo into the coat to make a rich, silky lather. Massage in. Rinse well, towel dry. You may notice the coat looks slightly tacky as it dries – this is totally normal and is just the natural oils which will be absorbed (rather than a synthetic shampoo product which tends to strip the hair) – it will dry normally and leave you with a now lovely smelling Little Beast!! Pet Spritz – 250ml Pure Organic spritz made with the finest natural ingredients and totally free from detergents, SLS, alcohol, parabens, sorbates, silicones, sulphates, palm oil and preservatives. Directions: Shake well before use. Spritz over your pet generously after and between washes to condition their coat, moisturise the skin and leave them smelling lovely. You can also spritz over their bedding to keep it fresh. Not suitable for animals under 6 weeks of age. For external use only. Avoid contact with eyes.  Soap Bar – 110g Pure Organic soap made with the finest natural ingredients and totally free from detergents, SLS, alcohol, parabens, sorbates, silicones, sulphates and preservatives. No spills, great for car boot and travelling, practical, less packaging, no wastage, long lasting. Directions: Rinse your pet with warm water and rub the bar into the coat to make a rich, silky lather. Massage in. Rinse well, towel dry. You may notice the coat looks slightly tacky as it dries – this is totally normal and is just the natural oils which will be absorbed (rather than a synthetic shampoo product which tends to strip the hair) – it will dry normally and leave you with a now lovely smelling Little Beast! !